Mach3 Turn Threading G76 canned cycle is used for threading on a cnc lathe machine which is controlled with Mach3 Turn software. There are other options for threading with Mach3 Turn like G32 threading G-code, but remember that G32 is not a threading cycle so cnc machinist has to do extra coding for every thread pass. 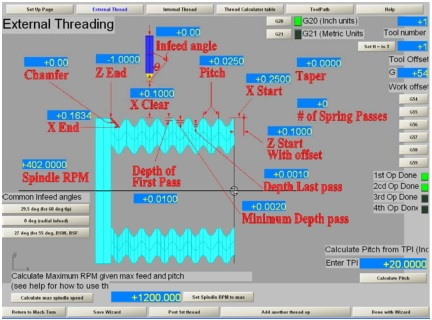 Mach3 Turn G76 threading canned cycle makes threading very easy just one line of code is required to program the threading cycle. The added benefits of Mach3 Turn threading G76 cycle are that with just few value changes cnc machinists can customize their threading operations. X – End value in x-axis. Z – End value in z-axis. H – Depth of first pass and subsequent passes. R – Thread start point in x-axis (optional). C – X-axis clearance for rapid return. C – gives the X clearance for the rapid return motion. 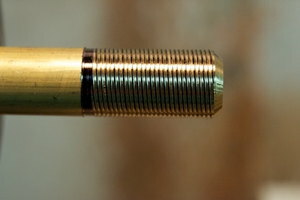 It is always specified as positive and Mach3 handles the reversed direction for an internal thread. Q – gives the number of spring passes (i.e. cuts at the X end position). I – gives the infeed angle in degrees. This is Zero for radial infeed and typically 29 or 29.5 degrees for a unified or ISO metric thread or 27 degrees for 55 degree angle forms like BSW or BSF. L – retract or chamfer angle is a “rotational angle” and not an actual chamfer. L360 would be 1 rev. L720 would be 2 rev.